Drizzle with 1/2 of the citrus-cider vinaigrette. Massage greens to soften leaves. Drizzle with about 1 tablespoon cooking oil. Place diced potato and minded garlic into the medium pot. Cook 10-12 minutes, or until fork tender. Reserve about 1/4 cup potato cooking water, then strain. Return potato to same pot. Add onion to hot pan. Cook 2 minutes, stirring periodically. Add seitan to pan with onion; stir. Add 1/4 cup water and pour over pan. Simmer 8-10 minutes, or until sauce thickens and coats seitan, stirring occasionally. Add celery and red cabbage to bowl with greens. To pot with potato add chives and 1-2 tablespoons of potato cooking water. Mash with a potato masher (or the back of a cooking spoon). Add half of the chives to potato; reserve the rest. Divide garlic-chive potato mash between plates. 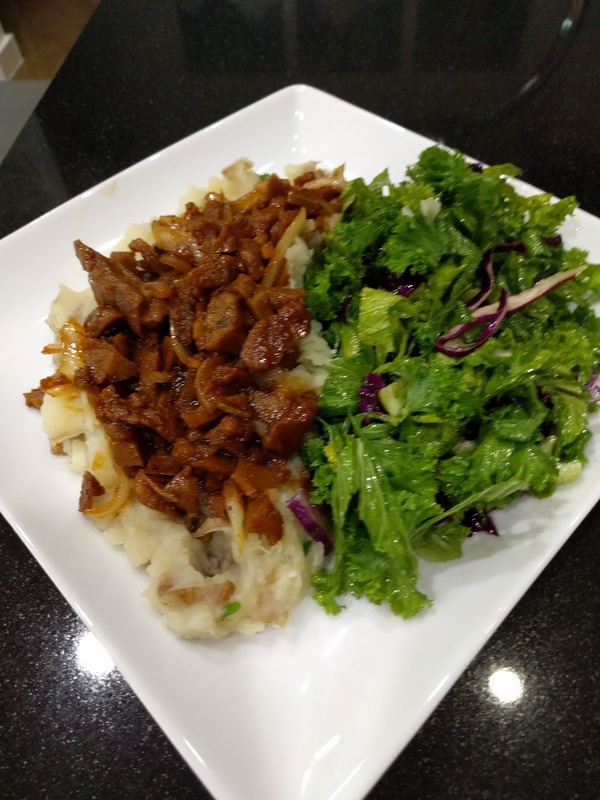 Top potatoes with molasses barbecue seitan. Serve mustard green salad on the side.